A 30 Million Dollar Cheezburger? 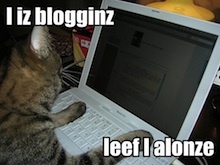 The Cheezburger network includes about fifty sites focused on popular internet memes such as I Can Has Cheezburger , FAIL Blog , Memebase , and The Daily What . What does CEO, Ben Huh, plan to do with the money? Expand of course. Huh isn't satisfied with being one of the top internet culture influencers in the United States and wants to get their presence felt overseas. This is probably why Japanese-based Softbank Capital was particularly interested in the deal. I guess we'll see if "I Can Haz チーズバーガー" has the same ring to it. A few weeks ago personal blogging platform Tumbr also raised an additional $30 million. Although Tumblr doesn't create the content on its platform itself, it allows an incredibly simple way for bloggers to share with the world. With the ever-increasing amount of content on the internet and the ease with which anyone can produce content, it is more important than ever to focus on quality so that your message can be heard through all the noise. The takeaway from all of this news is that content is still king. The Cheezburger Network makes its money through a variety of advertising, traditional media publishing including books, and merchandising showing that people are willing to pay for what they deem high quality content. In the past most people only considered television, newspapers, and radio to fall in this category. Now we can see that people want to consume a wide variety of content. From viral videos on Youtube to captioned photos on I Can Has Cheezburger, the definition of quality content is being blurred. Not only is the type of content evolving but so is where it is being consumed. People are always connected. Whether it's through their laptop, tablet, or mobile phone, the ability to reach people has never been easier. In order to take advantage of this it is important to make sure that your content is optimized for each of these devices. Lastly, creating content has never been easier. One of the reasons for Tumblr's success is because it allows you to publish from your "browser, phone, desktop, email, or wherever you happen to be." You can no longer use the excuse that you weren't at a computer. Whenever an idea strikes or something remarkable takes place you need to be ready to document it and share it with the world.